Children from Haverstock school met crew of set of the film Paddington 2. Tall security marshals guarded a secret entrance to the Paddington 2 film location. Our identities checked, confidentiality agreements signed, a wave of intimidation hit us when we were ushered into Paddington’s world. Strange black balloons, as big as beach balls, floated eerily amongst the mist – it turned out they helped reflect the moon. Overhead a massive camera on a crane loomed above a house like a prehistoric bird. Everything else was rainbow-coloured, as if the houses had been painted by a magic paintbrush. We had lots of questions to put to Charlotte, the assistant location manager. Us: Were all the houses originally painted in such bright colours? Charlotte: No. We painted that house green because it was a cream colour. Us: Will you paint it back afterwards? Charlotte: No, because they like it! We realised that filming in a place where people live might be tricky. Us: What happens if someone takes a peek out of the window and gets into the shot? We then thought about how slow the whole procedure seemed to be. Us: How long does it take to film one minute of Paddington – approximately? Charlotte: How much of a scene do you think we shoot in one day? Us: Three, four, five, sixteen minutes? Charlotte: It is probably only seconds! Charlotte: It is probably 20 seconds, if that, unless it is a big long dialogue scene. This is because action scenes have lots and lots of angles to shoot and sometimes things go wrong. 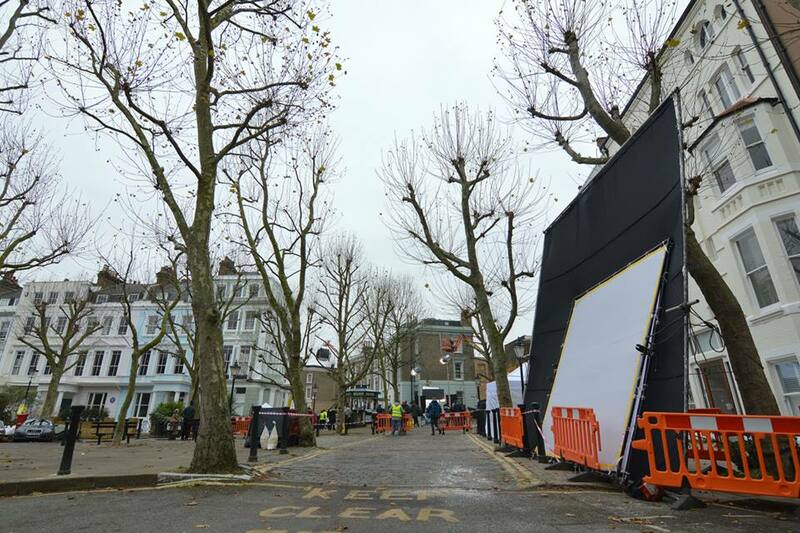 The residents of this clandestine location in Camden must be extremely patient, because having a film world created outside your front door must be disruptive, even though Charlotte and crew were very quiet. There is no shouting “Camera.. . Action” on this set. They do their best to make sure that everyday life continues, for example making sure that post and parcels still arrive. Sixty people and massive film equipment on your doorstep is a lot. We are pleased that Marmalade Productions have returned for Paddington 2. Thank you, residents, because without your cooperation the world of Paddington could not be created. We hope you will agree to Paddington 3 after this! And thank you, Marmalade Productions Crew, for giving us a glimpse of Paddington’s world. The school children (aged between 11 and 12) from Haverstock School involved were: Sabrina, Malise, Angel, Jez and Iman. Thank you!